Proceanis® Hyaluronfiller takes up precisely where everyday cosmetics just cannot reach as skin renews itself from the inside out. 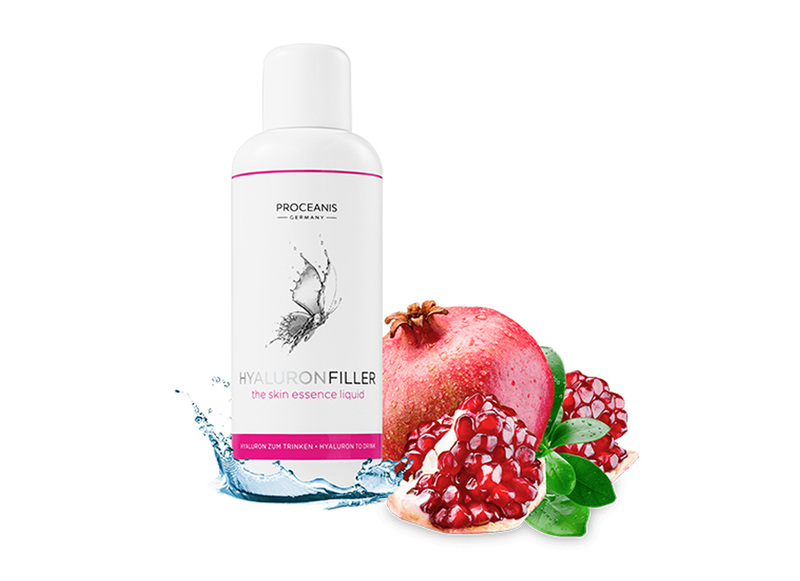 Proceanis® Hyaluronfiller assists this process by nurturing your skin in a natural way at its source – for younger looking, fresher skin. Hyaluronic acid combined with dermatologically valuable nutrients. Vegan and natural free of artificial sweeteners, aromas, and colorants. Easy to use. Just one sip a day. 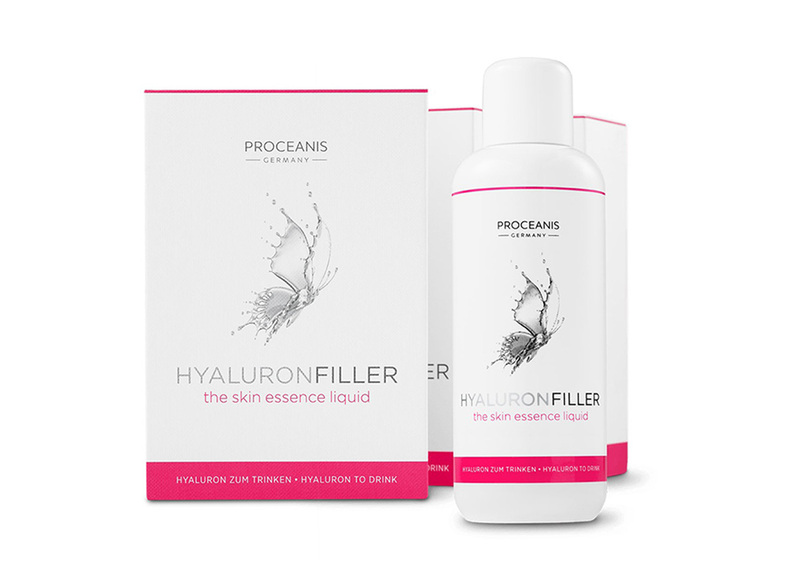 How do I use Hyaluronfiller? Once a day, take 10 ml independent of meals at any time of the day. What is the recommended period of use for Hyaluronfiller? The 50 day treatment should be taken without interruption since the metabolic processes of the connective tissue take time. We recommend to take it for 3 months to get the best results. The treatment can be repeated several times a year or even continuously. How should Hyaluronfiller be stored? Preferably keep Hyaluronfiller in a dry and cool place (not above 25 ° Celsius). For best taste, we recommend storing the opened bottle in the refrigerator. What is the tolerability of the product? 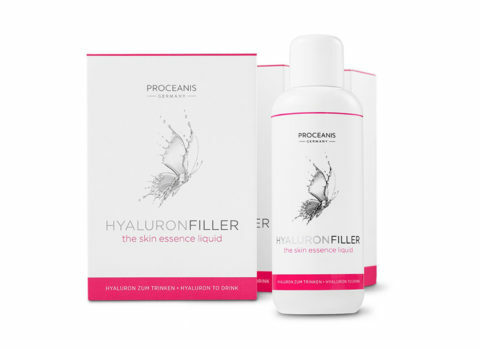 Hyaluronfiller is very well tolerated in the stomach and intestines as well as in the whole organism. This is due to the molecular structure of Hyaluronic acid, which is very similar to the body-like molecular structure. Are there known side effects or interactions? The intake of the natural Hyaluronic acid substance is safe. No side effects are known. Also, no allergic reactions or interactions of the Hyaluronfiller with other foods are known. Could unwanted water retention occur due to the water binding properties of hyaluronic acid? No. Due to microscopic mechanisms unwanted water retention or unnatural swelling of the skin cannot occur. Water retention is associated with the lymph system and is unrelated to Hyaluronic acid in the connective tissue. Is Hyaluronfiller suitable for diabetics? Yes. The contained coconut blossom sugar has a low glycemic index and a low dosage. 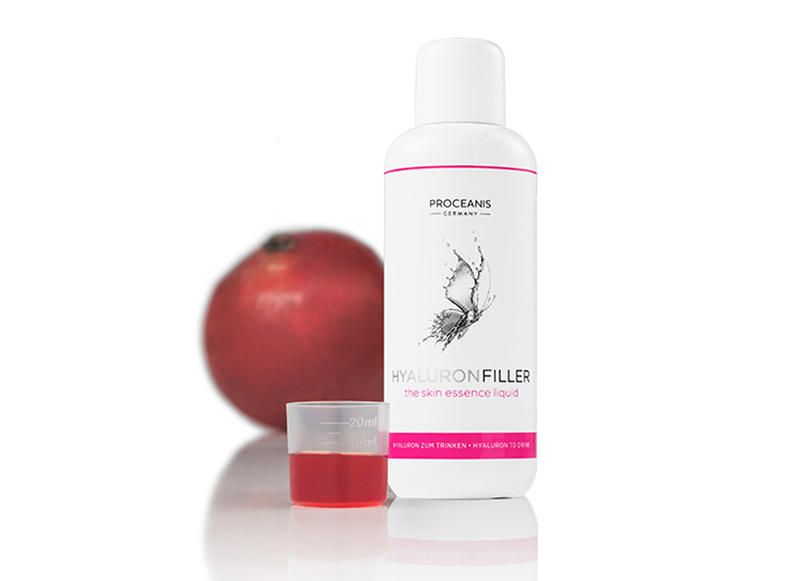 Can Hyaluronfiller be taken during pregnancy or whilst breast feeding? If you are pregnant or breastfeeding, please consult your doctor. Vitamin A which should not be taken excessively by pregnant women has a dosage of 15 % of the recommended daily dose in Hyaluronfiller.